Be it outdoors or indoors, working out is vital to stay healthy and fit. Fitness freaks have their own conceptions about choosing the kind of environment they want to exercise in. However, to help you take the decision rather easily, here are some of the advantages associated with both kinds of environments. It is possible to choose from a variety of places for exercise. It increases exposure to nature and fresh air. You get to work out alone as well as in groups. It is a great mood booster with proven positive psychological effects. Outdoor exercises allows for more quality interaction with family members and pets. Working out outdoors increases the scope for better absorption of Vitamin D which helps improve bone mass. In fact, studies show that people who exercise outdoors or take up any kind of physical activity like walking, biking, or hiking tend to be more physically active than those working out at fitness joints and gyms. Your fitness session is not dependent upon the weather. 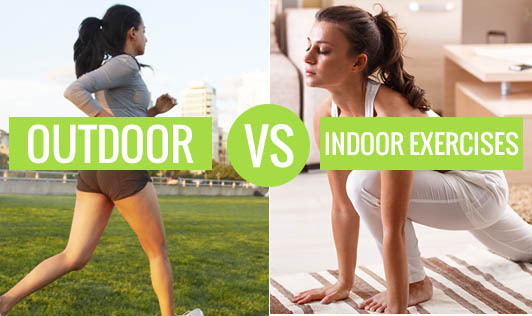 An indoor workout prevents you from exposure to allergens like pollens and dust. Indoor exercises are far more consistent and contain tried and tested methods for fitness. Specific equipment meant for spot reduction are easily available in the gym guaranteeing a more effective workout. Working out in a gym enables you to work out amongst people with common mindsets, thereby helping you achieve your fitness goals with increased motivation. You have a variety of fitness programs, diet charts, and exercise schedules. Keeping an open mindset will help you enjoy the benefits of both worlds. Both indoor and outdoor environments have pros and cons. It is up to you to decide how you can derive the best from both.